One test ride unlocks endless possibilites. 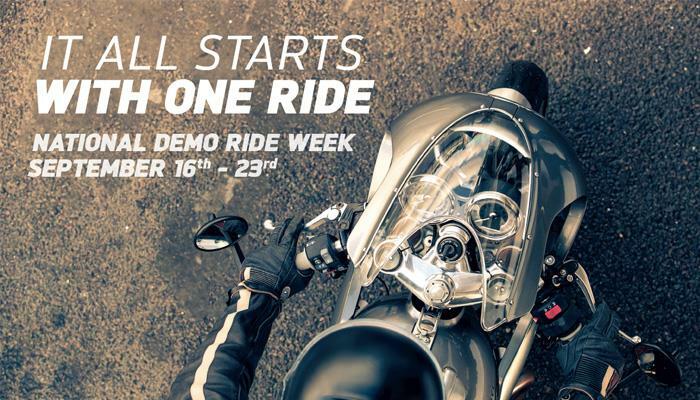 Triumph are launching a National Demo week from 16th – 23rd September, to get as many people out on our bikes as possible. So get down to your local Triumph dealership to book a test ride and join in with the fun. If you proceed to purchase the model you rode before October 2nd, we will contribute £500 towards personalising your new ride. Add Triumph genuine Accessories, items from our Autumn/Winter 2017 clothing guide or lowering your TriStar PCP monthly finance repayments. Contact your local dealer to arrange a test ride. Triumph are launching a National Test Ride Week from September 16th – 23rd. Take your test ride during this week and if you proceed to purchase before October 2nd, we will contribute £500 towards personalising your new ride. By purchasing the bike, the £500 we contribute can be used to add Triumph Genuine Accessories, select from the latest Triumph Clothing Range or use the value towards Triumph Insurance or lowering your TriStar PCP monthly finance repayments. The bikes included in our offer are the Street Family, the street racer styled bike, the Street Cup, the stripped back Street Scrambler as well as the contemporary take on the original Bonneville silhouette, the Street Twin. Also included is the Thruxton and Thruxton R, Speed Triple S and R as well as our Tiger Explorer range. Contact your nearest participating dealer to arrange a test ride. * Offer is only available at selected dealerships, please confirm with your chosen dealer. To qualify for your £500 Personalisation Contribution a demo ride must have been taken and the motorcycle purchased and registered by October 2nd 2017. Demo ride to be taken and purchase made from the same dealer. The £500 value can only be spent on Genuine Triumph Accessories/Clothing or used towards Triumph branded services, i.e. Insurance and Finance. The models this offer applies to are: Street Twin, Street Cup, Street Scrambler, Thruxton / R, Speed Triple S / R and all Tiger 1200 Explorer models.